As soon as I heard about this fun cake smash theme that mom shared with me… I jumped with excitement. I couldn’t wait. 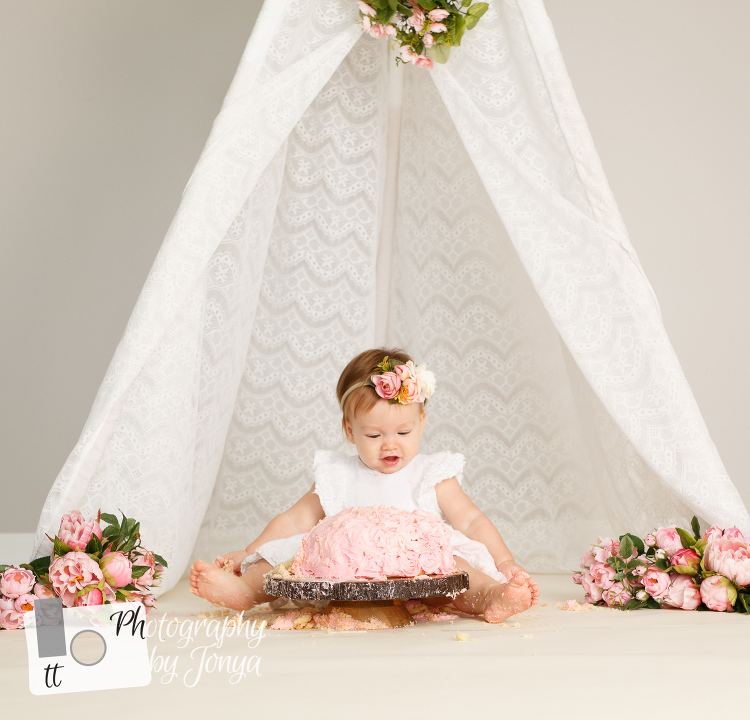 The teepee in this session was the same teepee we used for her lifestyle newborn session a year ago! Logistically, this cake smash was a little harder to figure out. I was very concerned that the cake could ruin the teepee and I surely didn’t want that to happen. It is a big prop to be used in the cake smash session, again, something I was a little worried about. But I never had any doubt that it would be able to be done and done well. I think that mommy did a great job making this light pink cake. Mom was confident that she was going to be able to make the cake and get it here to the studio. Luckily, they live in Holly Springs and there was not a long transport of the cake. With that pink cake, I knew we needed to have some pink flowers. I spent a great deal of time looking for flowers that would match her floral headband. After 2 hours of searching, I picked these up at Micheals. In my search, I found this beautiful garland that you can see at the very top of the opening of the teepee. Each and ever cake smash and first birthday session is different. I try and get a clear understanding of moms (or in rare cases dads) vision to help come up with something unique. A different twist, whether its with different flowers, cakes or combinations, every experience is different. If you have a little one getting ready to celebrate a first birthday, make sure you consider a 1st birthday cake smash session session for them. You won’t regret it… but you will probably regret not doing it. Headshots are so important to update on a regular basis. Your professional headshots are, many times, the first time your customer sees you. You wouldn’t want them to see a 20 year old headshot of you and be surprised or taken aback when you don’t look like your photo said you did. By having an updated headshot, you are starting out with honesty about who you are and what to expect. Whether are you are starting your own business, rebranding your current business, looking for career opportunities, or speaking as an expert in your field, there are many reasons to update your headshots. The great news is they don’t have to be a hassle and don’t have to take a lot of time. Most of my headshot sessions are done within 30 minutes. It is because I help plan your headshot session ahead of time. I help understand your brand or the way you plan on using your headshot to give you direction on what to bring. I had the pleasure of working with Brian Woomer and his Woomer Insurance team in downtown Apex, NC. They have a quaint, industrial feel business office on Salem Street. It is decorated with watercolor canvases from a local artist of popular landmarks in the community. The texture of the water marks goes beautifully with the exposed brick on the walls. The front of the office looks onto the street downtown. Brian and his team help bring a very personal touch back into the insurance industry. It offers such a unique insurance experience. If you are in need of a headshot update and are not looking forward to it, let me help! Together we can make the experience way easier and better than it seems. So whether you are rebranding, updating or expanding, let me help you update those professional headshots! 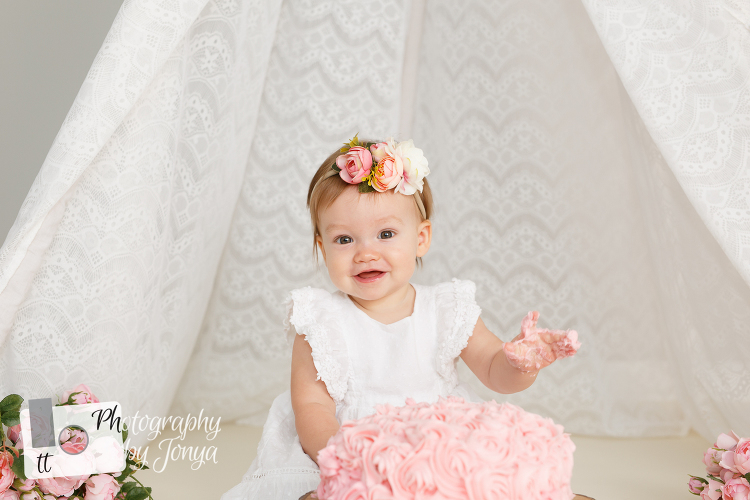 It is so hard to believe that Claire’s first birthday photography session is all done. I remember her newborn session like it was just a month ago…. but it hasn’t been. It’s been well over a year since the newborn session! Just like most cake smash sessions, Claire started out very apprehensive of what she was supposed to do with this cake, and the flowers on top of the cake. The cake is called a naked cake, it was designed and delivered by Holly Springs baker, BillieJo Cochrane with Baked by Billie. Once Claire got more comfortable with the cake smash set up, she quickly realized that cake is delicious and this session was going to be so much fun… and… well CAKE!! I didn’t know what to expect, considering she hadn’t had cake and the flowers on top of the cake could be a distraction. The hope, was sincerely, that she wasn’t going to prefer to eat the flowers over the cake. Although she thought the flowers were interesting, she was wanted to fill up on them. Haha! Claire didn’t mind keeping the beautiful floral crown on during most of her cake smash. She was quick to let us know when she was all done wearing it though. Then, it was time to clean up! Most babies at this age love a bath….. but again, they are not used to having a bath in front of someone AND a camera. But once we started the bubble machine she was ready to have some more fun. She splashed around and giggled. As soon as Claire was comfortable she was reaching for all of the bubbles and even giving us some adorable belly laughs. You can’t deny that a baby’s belly laugh makes you laugh too. Someone had a birthday!! It was Hannah! I remember the day her mommy shared that Hannah was expected to make an arrival. I was so excited for the whole family, including a soon to be promoted big sister. The beautiful cake was made by Baked By Billie. I have been working with the Patrick family for a few years now… and every time I have a lovely time and the sessions get better and better. This session was scheduled to document Nora’s 2nd birthday. What I loved about this is that it was a “Mommy and Me” session. I loved the idea of an outdoor session, because I have missed photographing sessions outside being that it was such a cold winter and a very rainy spring. We took these photos at a beautiful park, in the morning here in Holly Springs. About 20 minutes from Raleigh. The sun was shining beautifully through the trees and it gave us such beautiful lighting. For this mommy and me/ birthday session, mommy communicated with me that she was looking for something delicate, gentle and had a beautiful bohemian feel. This was easier achieved with light colors, especially with the blush pink, long, flowing dress that mommy wore. And I have to be honest, this color pattern is my favorite for these sessions. It truly brings in a feminine feel. Just to mention it again, this was not just a mommy and me session. This was also a session to help document this sweet little girl’s second birthday. What better way to document a girls birthday than with flowers… Big, beautiful, delicate, blooming flowers. It seems as though she liked having the flowers there as well. She spent much of her time inhaling the beautiful scent of them. I wanted to make sure that they have were able to take these flowers home and enjoy them there. So we didn’t spend too much time using them for the session so that they were able to enjoy the flowers after the session, at home. I promise, they smelled beautiful. I wish there was away to share that beautiful floral smell with you through the computer. After we were all done using the flowers, we got some lovely candid shots of of just Nora. She hammed it up for the camera just enough. She was such a great sport, considering she had some dirt on her feet that got through her sandals…. She really didn’t mind too much. I was far more worried how about getting any of that dirt or mud on their dresses. After all, the colors were so light, it would have showed and given me far more time with edited. Luckily, for all of us, we avoided that concern. Every time she stood on the grass, we wiped her sandals and feet off to keep mommy and daughter completely dirt free. Here are just a few more portraits from the mommy and me portion of the session. I hope you love looking at these photos as much as I love taking them. One of the greatest gifts I have as a photographer is when I get to work with families through the years as the children grow from babies. This sweet little girl was just a baby last year for her family mini session, and in one year – She has grown SO big! This first photo is a shot from last years family portrait session. I remember her curiosity when her head was played on the plush grass. AND… this is her now!! She is such a big girl now! You can tell that she brings so much joy to her family. And you can tell that she loves her mommy and daddy to the moon and back. She is starting to find her own independence but she still lets her mom and dad love on her, especially for the family portrait shots. And she surely loves to explore. The family mini session we had this year was at the WRAL Azalea Gardens, in downtown Raleigh, about 20 minutes from Holly Springs. The weather cooperated and the azaleas were in full bloom. And this little miss was all about exploring ALL of the colors on the property. From the reds, blues, purples and even orange – she wanted to see it all. And she did. This watermelon inspired cake smash session was a blast! At first Jemma looked at it kind of funny… a little unsure as to what she should do with this pink and green “thing”. The great news is that she wasn’t scared of it and was completely open to the idea of at least trying to eat a little. And then it was on!!!!!! Jemma tasted a little bit of heaven and went from unsure to ecstatic!! Look at this photo below. This is the shot I got when she realized “this is the good stuff”. She wasn’t only curious about the colorful cake in front of her, but Jemma was extremely curious about my camera. She was so funny because every time I would set my camera down or hold it away from my face, she would stare at it. Her mommy told me what Jemma really wanted was to see how she looked in her photos. Haha! She saw that she was rocking the session and crawled back to her cake. It was so adorable! 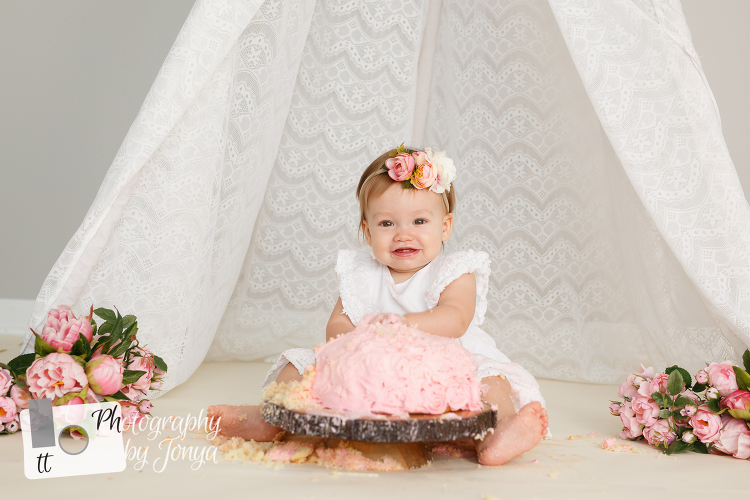 I always like to tell the parents during a cake smash photography session, you may see the sugar hit them. They get a little twinge of excitement. It’s always hard to know when it’s going to happen, and it happens so quick the camera doesn’t usually catch it. But if you look at the photo below, the camera got it this time!! The sessions was great, mommy was laughing, I was laughing and so was Jemma. We all had fun and we had tons of frosting on us. It is also so funny when they feel frosting between their tiny little toes and on their feet. It is a strange texture that most of them have never felt before. It made Jemma curious again. These last two cracked me up so I just had to share them on the blog. Thank you for sharing your first birthday with me lil Miss Jemma!!!!! If you would like to see more 1st birthday and cake smash sessions, click HERE.